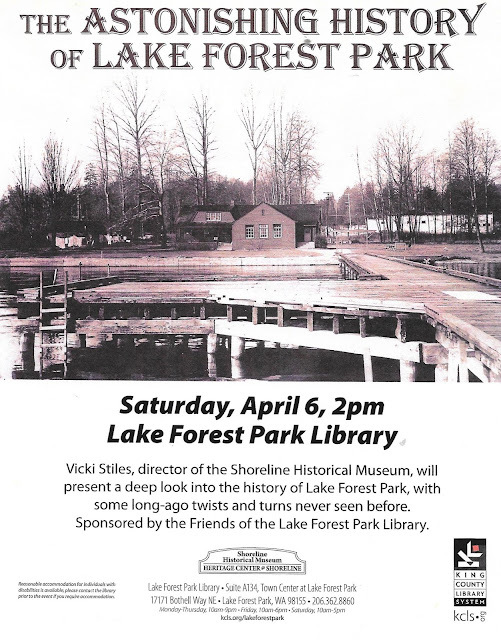 The Friends of the Lake Forest Park Library are sponsoring a presentation on LFP history on Saturday, April 6, beginning at 2pm, in the LFP library on the lower level of Town Center, intersection Bothell and Ballinger Way NE. Vicki Stiles, Director of the Shoreline Historical Museum, will share historical perspectives and fascinating anecdotes about this local community. All are invited, and admission is free. The KCLS plans to follow up with similar presentations at the Shoreline and Richmond Beach branches. Shoot; I have to work that Saturday; I am SO interested in this presentation. There is a series of history booklets from the mid-1970's at the Shoreline Library about the history of what is now Shoreline, that touch on the history of Lake Forest Park. After reading those, I'm keenly interested in knowing more!